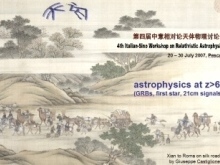 The 4th Italian-Sino Workshop on relativistic astrophysics will be held in Pescara, from July 20 to 29, 2007. This meeting follows the tradition of the successful collaboration and exchange among astrophysicists of China and Italy since 1980s. As two examples, we can mention that the Italian edition "La creazione dell'universo" by Fang Li Zhi and Li Shu Xian was published on 1990, and the Chinese edition "Gravitation and Spacetime" by H. Ohanian and R. Ruffini is published on 2006. The topic of this meeting will be the astrophysics at redshift > 6. The research on the epoch of reionization has obtained significant progress. Both Italian and Chinese colleagues deeply involve this approach. The group at ICRA, Rome has made extensively effort on developing a coherent model of gamma ray bursts (GRBs), which is believed to be effectively probe of the early universe. In Chinese side, a new project of 21CMA, aiming to detect redshifted 21 cm signals from high redshift objects, is being constructed in XinJiang. Some simulation on the formation of first stars is also going on. Therefore, it would be timely to hold a workshop on this hot subject. This meeting is not limited to astrophysics in Italy and China. It is open to everybody who is working in this field. Registration will take place at the secretariat desk from Monday to Friday, from 12:00 to 1:00 pm. Please, download the form to be filled-in with your data. Type your information and e-mail it to Veronica D'Angelo or to Gabriella Ragni.